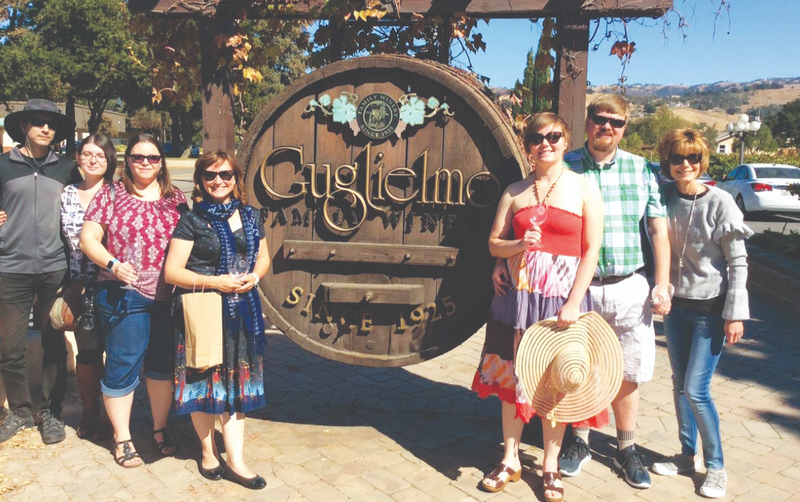 WINE ON TIME California Passport Tours has created custom tour packages for local wineries especially for Fall 2018 Passport Tour. Have passport, will travel! It’s a common cry for those bitten by the travel bug. For wine lovers, however, travel takes on a whole new meaning—typical destinations revolve around terroir and taste. For the South Valley oenophile, or wine connoisseur, making a complete daycation out of wine tasting is made easier—and more fun—with a tour. Leave the driving—and the logistics—to the lively and contagiously energetic Ana Lelescu of California Passport Tours. Her mission is to intimately connect participants with the history, beauty and bounty of this winegrowing region by introducing them to the people who make it happen. “Our tours focus on bringing local friends and neighbors together to showcase our unique South Santa Clara Valley lifestyle,” says Lelescu. Lelescu’s business offers the perfect way to indulge during Fall 2018 Passport—a month-long event put on by the Wineries of Santa Clara Valley. Formerly a weeklong endeavor, the organization expanded its Wine Passport Week to an entire month for the first time in March for its Spring 2018 Passport. And now, just in time for harvest, the organization has done it again for Fall Passport, which takes place Sept. 8-30. With Fall Passport in hand, folks can enjoy everything from wine tastings at 31 participating wineries to a wine country lunch or dinner—perhaps both—at many area restaurants. And they can take advantage of reduced rates at local lodging establishments. VALLEY WINES California Passport Tours focuses on bringing local friends and neighbors together to showcase the region. Lescalu, a Morgan Hill resident, says with being minutes away from the busy Silicon Valley, she’s interested in providing a reprieve from dealing daily with stress and sitting in traffic. Lelescu, who grew up in repressive communist Romania and came to the U.S. in 1992, was eager for a chance to spread her wings in America. She started the California Passport tours based on significant “tour guide” expertise, garnered by showing her beloved family and friends from the old homeland a good time whenever they visited her in the states. She couldn’t be more thrilled with the reception her tours have enjoyed. And Lelescu’s customers aren’t shy about their praise for California Passport Tours. Mryna Robles, a new San Martin resident who often hosts friends and family from out of town says she’s hired California Passport Tours twice so far and is delighted with its professionalism and laid-back attitude. Robles was equally impressed with the flexibility of the company and its efforts to accommodate the needs of her party. As a repeat customer, Robles says she eagerly recommends them to anyone seeking a unique outing in the flourishing wine district of the South Valley. Henson, who works in Morgan Hill with Kennett Productions, a firm specializing in event consultation and development, says she hired California Passport tours for a team-building outing. Henson says there are a lot of different elements to California Passport Tours that make for a special experience. Henson says the company is great to work with and made their day so carefree. The fact that California Passport Tours is local, however, is what Henson believes makes for a unique experience. The secret, Lelescu explains, is that her tour guests will be treated like she treats her own family whenever they visit. “We love to celebrate and savor every moment when we are together as I am never sure when I will see them again,” she says. For Fall Passport, Lelescu created a special package for eight people for $720 (plus service fee) that includes wine passports for each person, tastings at four wineries and a gourmet picnic lunch at the second. Guests may choose the four wineries they want to visit, or ask Lelescu to customize the tour. For more information about California Passport Tours, visit californiapassporttours.com. To find out more about other partner businesses, local wineries and special offers during Fall Passport, visit the Wineries of Santa Clara Valley at santaclarawines.com.